The Toyota NS4 concept isn't too bad looking, if a bit tame for a concept. It has some striking lighting approaches, a very appealing interior and glassed roof treatment, and pleasing proportions. I wish I could unread what I read in Toyota's marketing materials so I could try and appreciate the vehicle, but, sadly, that's just not possible. Readers may wish to take a moment to vomit now. The fundamental concept of the car was built around a smartphone-type interface metaphor, and much of what the concept aims to demonstrate are the usual buzzwords of connectivity and social networking, though some novel ideas are employed to this end, like special glass more transparent to radio waves. The exterior's reasonably sleek, but also not that different from many current sleek sedans currently available, like the Aston Martin Rapide or the Volkswagen Passat CC. The front end treatment, aside from the novel headlight treatment, looks pretty unpleasant, resembling a proboscis monkey with its very flaccid and droopy nose. The interior does seem very well thought out, airy and open, with some very appealing ceiling flush-mounted lighting panels. 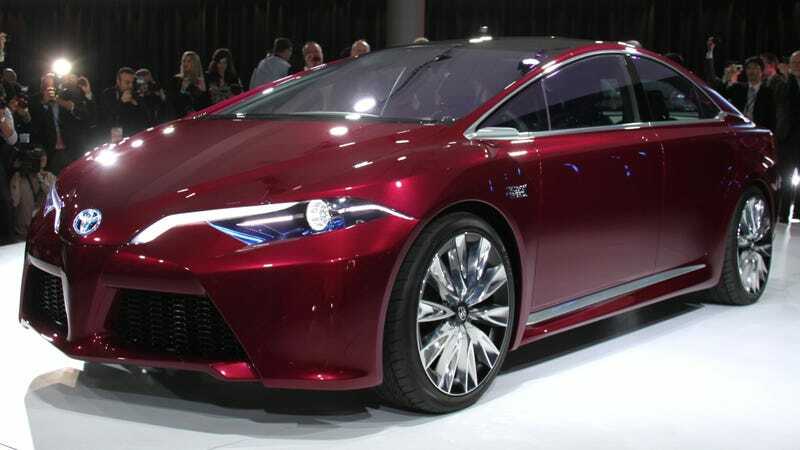 Aside from scrutiny of the design, there's very little else to go on here, as Toyota's pretty mum on what's making this alleged plug-in hybrid go. Without any better information, I'm going to spread a rumor that it's going to use a 475cc air cooled flat-twin that's based on the old 2CV motor, coupled to a potent electric motor sourced from Otis, the elevator company. That sounds about right to me. There's also no mention of what sort of batteries, so let's assume 3000 AAs. The concept does have a vast suite of driver assist aids, including sub-millimeter wave radar to help the presumably Facebook-distracted driver avoid swerving into other lanes or running into anybody. Toyota suggests a global introduction by 2015, but I'd counsel against anyone holding their breath.